Chelsea striker Diego Costa should change his game after picking up a three-match ban for stamping, says Manchester City boss Manuel Pellegrini. 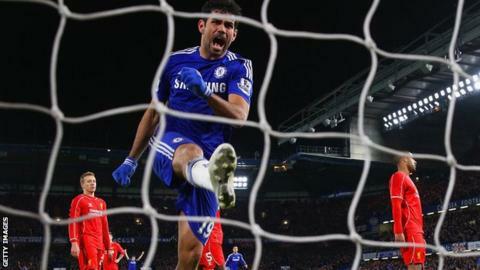 Costa cannot face City in the Premier League on Saturday after being found guilty of violent conduct. The Football Association ruled he stamped on Liverpool's Emre Can during Tuesday's League Cup semi-final win. "It will be a good thing for him to change a little bit in the future," Pellegrini said. "He doesn't need to play in that way because he's a very good player." Costa denied the charge against him, which related to an incident that took place in the 12th minute of the the second leg tie at Stamford Bridge, which Chelsea won 1-0 to secure a 2-1 aggregate victory. Manager Jose Mourinho, who said at the time the incident was "absolutely accidental", did not give a news conference on Friday - a move that is against Premier League rules. At his own news conference, Pellegrini refused to discuss the Chelsea manager - with whom he has a long-running rivalry. "I don't talk about Mourinho," he said. Chelsea lead second-placed City by five points, but Pellegrini played down suggestions that Saturday's game will decide the Premier League title. Pellegrini said: "It's not the game that will decide the title, because after that, we have 45 more points to play for. "You'll remember that this club won the title after being eight points behind Manchester United (with six games to play in 2012). So in football, you never know. "But it's an important game. It's important for us to try to close that gap as soon as we can."